Judging by what I'm seeing around so far this month, everyone is having the same thought processes, de-clutter, de-clutter, de-clutter. Our house is in serious need of it, since having Patrick and really getting back into blogging again, the amount of things we have accumulated is sickening, boxes upon boxes, along with a toddler birthday and Christmas, you can just imagine the influx of new things that without throwing out the old stuff yet it really all was becoming a bit much. I ended up actually turning into my de-cluttering mode on Christmas Day, which seems ludicrous I know. I had seen videos and Instagram stories of others enjoying all the toys out everywhere and I do think good on you, but that is not me. When the boys went to bed I had to open all of the boxes, battle with cable ties and scissors to free all singing and dancing plastic monstrosities, to find homes. I couldn't live in a sea of toys, even for a day. It took me over two hours to do that, that evening but it was so worth it to wake up to a semi-organised house on boxing day. The boys were able to really appreciate and play with their new things because they could access them easily, it also meant our family time wasn't taken up with doing the cardboard box battle that I did the night before. My mind was happy. Although, it did spark a storage crisis one that I'm well on my way to solving. I've already ordered a few bits to store some of the boys bigger toys & puzzles in, as well as actually purchasing some new Muji bits for myself. My goal of February is to stock up on storage. Over the following week I kept tidying and cleaning to a minimum (not going to lie something I do regularly - ha!) as I didn't want to waste our family time on chores. But since January hit I've really become aware of what we need to do to make this house clutter free. I think an inspiring video by the lovely Jules Furness really got me kick started as I wasn't taking into account actually how much complete rubbish we had stored. For example, some mega blocks we had in a storage tub downstairs that have happily sat untouched since we moved into this house almost 2 years ago - completely absurd when you think of it. Noah is almost at the stage where he could handle lego if I supervised him, and duplo was something he was never into so I doubt he'd going to become a budding tower builder the day after I throw them out. I was keeping things for the sake of keeping them. So I developed a little motto for myself, that began to help me on my way. I'd ask myself four questions, and at the end if I was still feeling guilty about throwing something away I'd pack them up ready to be dropped off at our local charity shop. If it hasn't been used in six months, won't be used next month, wasn't sentimental & wasn't 100% needed, it was gone. The 100% needed option may seem a bit obvious, as minus food and water nothing is really truly needed is it, but in my mind after asking the first three I still found myself thinking oh well what if Patrick starts to enjoy the blocks when he's older? And if I thought like that about everything we'd have a house rammed full, so thinking to myself well 'Is it really needed, will Patrick truly be missing out if he doesn't have some duplo bricks?' No of course not - the amount of other toys we have I really find it hard to believe he'd long after some as my mind is telling me the only thing Patrick will probably want is whatever Noah is playing with - and vice versa. I've set myself some goals since, each month I want to have a main aim and focus. 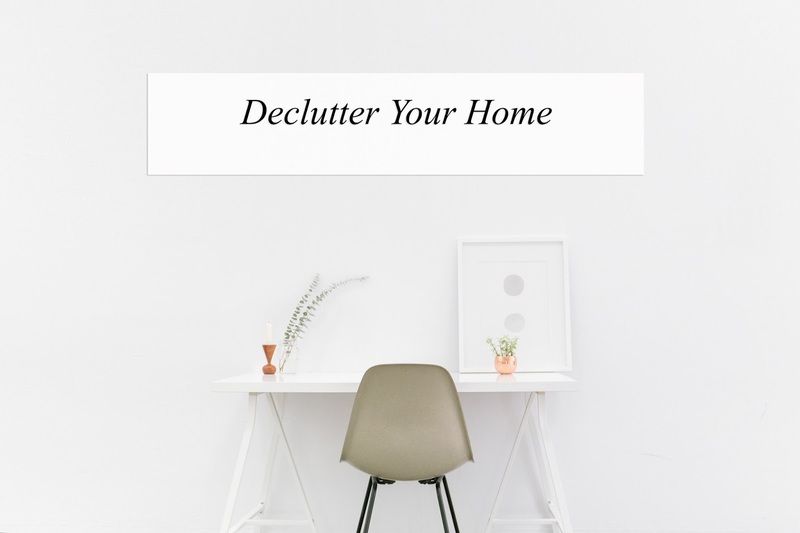 For example, this month is de-cluttering and getting rid of everything we don't need. I can't even begin to organise or tidy properly when our house is so full of things. I've emptied out all of the boys toys, tipped away all the broken bits and random puzzle pieces that lurk at the bottom of storage tubs and boxes. I've boxed away any of their clothes that I might want to keep in case we decide to have another, or one of my siblings have a baby (For the love of god let us have some cousins this year), and thrown away any faded out or just clothes I didn't want to keep. My desk and it's contents have been completely gutted with me throwing away so much, it was just becoming absurd the amount of silly things I was accumulating after years of beauty box subscriptions - I dread to think how out of date some things where. And as I'm writing this post, we don't really have much left to do, the boiler cupboard and under the stairs are the last of the two areas to be tackled. Which we're hoping to get done before John's annual leave finishes, although the fact it gets dark so early thus causing the tip to shut at 4 is really limiting us, it's a good 25 minute ride plus waiting in queue yanks out a good hour of valuable time. But we're doing our best. 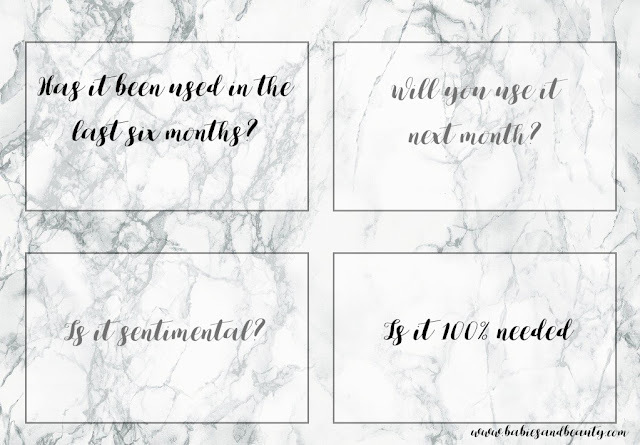 If you'd be interested in seeing what my organisational goals are each month do let me know and I can do a little post detailing each of them and what we plan to do. 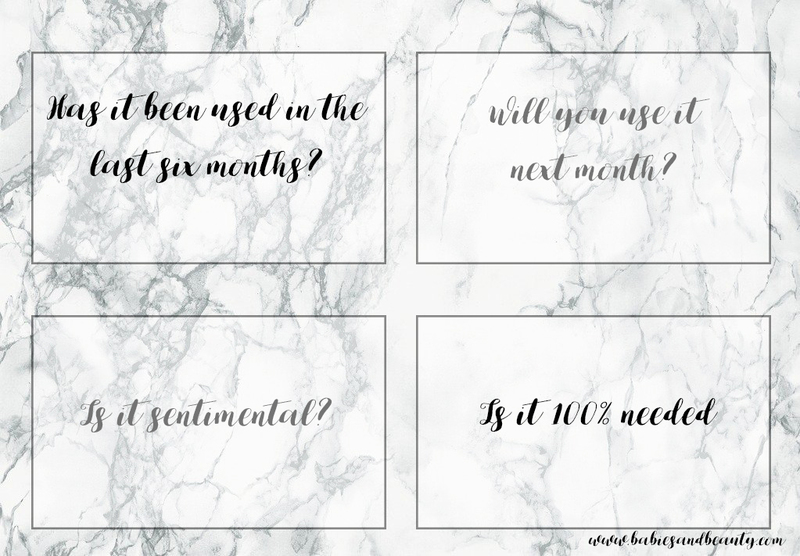 Yes, please share your goals for each month! I usually do an overhaul of the house a few times a year but since little N arrived it's been harder to find the time and we've also been inundated with gifts at Christmas - I'm still trying to find a place for everything! I think setting a monthly goal is more realistic and a great idea I'm going to steal! Having a baby means we have a lot more crap! So I've started to really go on a ruthless decluttering mission - I can't lie all the speed cleaning in YouTube definitely inspired this too! MUJI storage is life though - love that stuff!